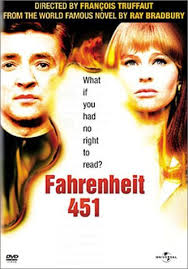 While puttering around in the library a couple of weeks ago, I looked down at the cart where they put the recently-returned DVDs and caught the soulful gaze of Julie Christie on the cover of the recently re-issued 1966 film version of “Fahrenheit 451” directed by Francois Truffaut. So of course I had to check it out. The French auteur’s first English-language movie has always had a mixed reputation at best: the acting and dialogue was deemed too starchy and the themes of Ray Bradbury’s classic speculative novel too flattened out. But it had been so long since I last watched it (probably on a 13-inch TV) that I figured a new viewing would be like a re-discovery. And how. In this age of restored content and hi-def screens, Truffaut’s “451” looks fantastic with its autocratic iconography, bold primary colors and the retro futurism of its deftly chosen locations. Also, in view of broad societal shifts since it was made 48 years ago, the film seems more prophetic than ever. Coming soon to a Barnes & Noble near you! Of course, the central premise of Bradbury’s cautionary tale may seem silly in retrospect. In a world where all literature is banned, the protagonist, Guy Montag (Oskar Werner), is part of a team “firemen” who rely on informants (usually neighbors) to swoop down on the homes of violators and publicly burn their hidden stashes of books. The plot centers on Montag’s crisis of conscience as he starts to read books that he has slipped into his kit bag during raids. Matters are complicated by his budding friendship with the non-conformist Clarisse. Both Clarisse (a student in the novel but a young teacher here) and Linda (Montag’s media-overloaded, pill-popping wife) are played by Christie. The institutionalized conflagrations of this story can appear far-fetched. Yet when Bradbury wrote this in 1953 the Nazi book burnings were in recent memory and the dirty dealings of the House Un-American Committee were in full swing. 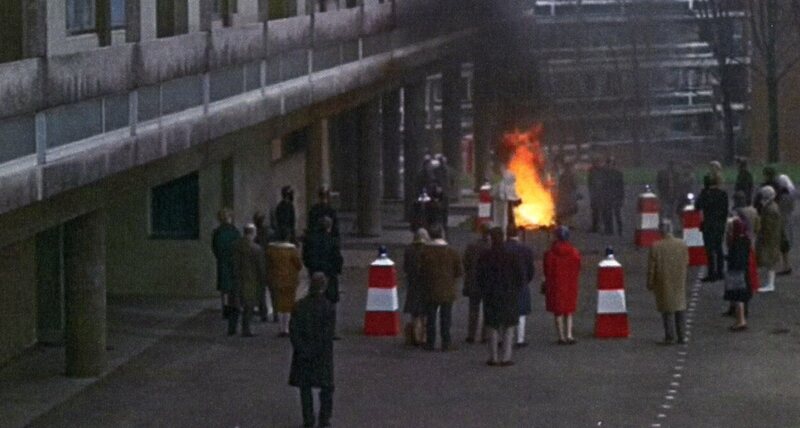 The state-sanctioned pyromaniacs of “Fahrenheit 451” were more broadly symbolic of the casting off of all independent knowledge and self-determination. Behind the visual hyperbole of the black-shirted firemen with their brass kerosene squirters and fascist salutes, Truffaut tweaks some of the book’s subtler messages to great effect. 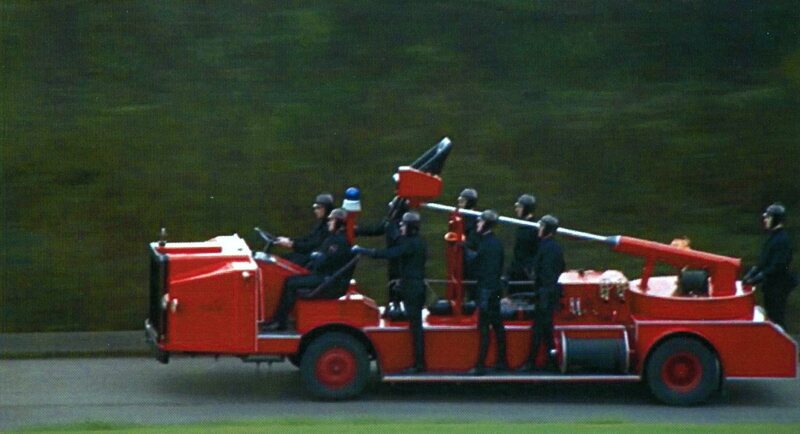 Although this is supposed to be a totalitarian society, there is no overarching Big Brother; the local fire department zipping around in their pyromobile is about the only representation we really see. Instead, the tiresome tirades of some blowhard dictator has been effectively supplanted by ingratiating TV hosts making every one of their “cousins” feel as if they are Special just by tuning in. But access is a long way from enlightenment. In our own age, ads endlessly hawk Internet speeds “ten times faster” than speeds that are already all but instantaneous, an age of aggressive techno-snobbery where people wait in overnight lines to trade in their “old” I-phones that were state of the art six months before. Relatively recent analog technologies are dismissed and even disdained while we barely bother to shrug at the widespread loss of personal privacy and make no distinction between reasonable progress and a runaway train. Meanwhile, deep-seated problems like income inequality and a ticking environmental time bomb, while not exactly ignored, fight for attention in a 24/7 overflow of content where melting Arctic pack ice and the latest celebrity baby bump are two equal drops of information and bookstores close left and right. Truffaut’s film is an uncanny time-indefinite fable, where such technology, as far as it could be imagined back then, has rendered a population inured to any causes but their hedonism. In the world of “Fahrenheit 451” there are few options left, which make’s Christie’s housewife Linda more sympathetic than her counterpart in the book, who was named the less-appealing Mildred. But Bradbury made clear in the book that the totalitarian state came about in part because the over-abundance of pleasure-delivering technologies sapped the populace of their willpower to challenge authority, and the jackbooted thugs just stepped in to finish the job with flamethrowers. We still have something of a choice left, but it doesn’t appear to stretch out indefinitely. 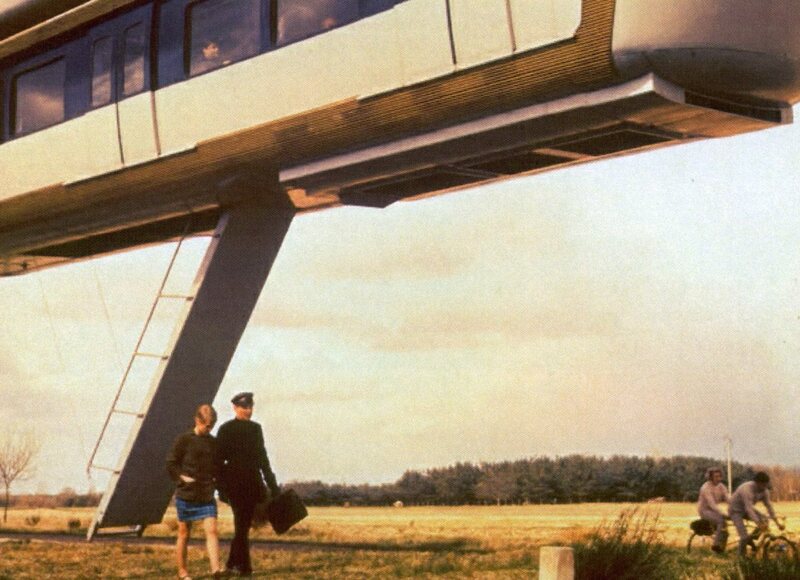 If our own era is the start of an invisible dystopia, then give me the film’s version, where at least you can ride home from work in an awesome monorail (that lets you off in a meadow!) and walk back to your house chatting with a mini-skirted bookworm subversive. Oskar Werner (who was best known for his role in Truffaut’s “Jules and Jim”) is quietly impressive as the conflicted Montag. The Austrian actor (who was a pacifist) had fled the Nazis in the latter stages of World War II and with his young child and half-Jewish wife, waited out a battle by hiding in the Vienna Woods. This scenario is echoed in the film’s final scenes when Montag, who is found out and forced to take part in a raid on his own house, takes drastic action before fleeing. (Even the clunky process shot of jetpacking policemen in pursuit–the film’s one big visual miscue—-seems endearing in retrospect). He follows an old railroad line to a forest populated by the Book People, each committing one volume to memory so as to carry forth the world’s knowledge while staying within the law. Of course, too-hip critics gagged at the achingly sincere tableau of societal holdouts introducing themselves to Montag as their title. Ray Bradbury may have liked many things about the adaptation, including the decision to not kill off Clarisse and to have one of the Book People introduce himself as “The Martian Chronicles” (a surprise tribute from the director). But the official consensus was that the film was a Disappointment and the monolingual Truffaut would not make another English-language film nor would he attempt another genre movie—although an admirer of the novel he was not a big science fiction fan. Too bad, “Fahrenheit 451” is a great embodiment of the old saying that “if you don’t stand for something, you’ll fall for anything” and this worthy cinematic complement to the book drives home that ever-salient point even further. Check it out and see if you agree, cousins. Loved this! Can’t wait to see that movie at some point. Great review, as always. Of course, I need to read the book before I watch the movie, but I’m not surprised to hear that some of the things Bradbury predicted in 1953 more or less came true, albeit in slightly different forms. I really enjoyed “The Martian Chronicles” when I read them a few years ago, which is another good sign. Cheers! The book’s great and a quick read at about 150 pages. Although I’m a great fan of Bradbury, I only got around to reading The Martian Chronicles last year. Maybe it’s time to check out the 1980 series of M.C. (starring Rock Hudson!) which was also maligned when it came out. Great review for the film adaptation of one of the seminal works of fiction, Rick.